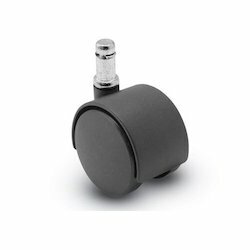 These types of Furniture Caster Wheels not only provide better mobility but also give a decorative touch to the furniture of your place, be it home, hotels, lobby, offices or even shops and malls. You can choose with our range of colours and size available to suit your choice. Available in various finishes these Furniture Casters are used for many commercial purposes like furniture, store fixtures, office equipment etc. They have great load capacity and work well for many years. Looking for Furniture Caster wheels ?